This astonishing piece of research by Daniel Bilton & Charles Gluck sums up almost everything I believe about good and bad training. Three simulated phishing emails with remedial help if they failed i.e. spaced practice, learn through failure exercises. Happy sheet evaluations for both were through the roof. Based on actual simulated attacks, they discovered no significant difference between training and no training! The researchers attributes their success to the spaced practice approach where the simulated emails put them to the test and with each of the three iterations more and more trainees became competent at dealing with these dangerous, fiscal requests. The researchers also saw gains from learning at the point of realisation, by doing something relevant at that moment, not on some disassociated training course. 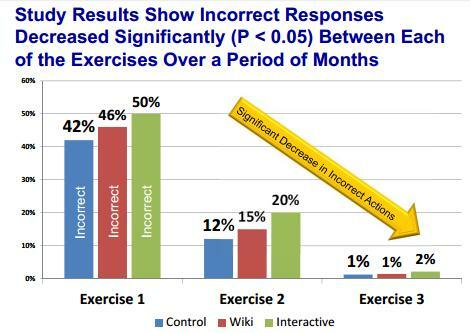 It was the failure-triggered training, delivered on teh back of unannounced, blind exercises, combined with immediate tailored remedial training, provided only to the users that “fail” the exercises, that did the trick. 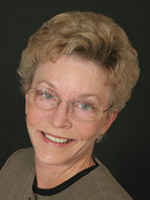 Richard Mayer and Ruth Clark are among the foremost researchers in the empirical testing of media and media mix hypotheses in online learning. Their e-Learning and the Science of Instruction (2003) covers seven design principles; multimedia, contiguity, modality, redundancy, coherence, personalisation, and practice opportunities. Clear explanations are given about the risks of ignoring these principles - with support from worked examples and case study challenges. It should be a compulsory text for online learning designers. Their precise studies have confirmed that our media mix (text, graphics, audio, animation, video) in online learning is often flawed, resulting in cognitive overload and dissonance. Perhaps their greatest contribution has been in identifying redundancy as a serious problem in screen-based learning but they are known for research that produces clear practical recommendations that do not pander to those who think that media rich automatically means mind rich. If you were asked to sum up the psychology of learning in three words, it would be ‘less is more’, that’s also Mayer and Clark’s mantra. In one study, Mayer, et al (1996) presented 600 pieces of scientific learning and found that briefer versions, which were concise, coherent and co-ordinated, resulted in far more effective learning. They are precise in their recommendations, ‘There is a clear pattern in which the more words added to the core verbal explanation, the more poorly the student does in producing the core explanative idea units. These results are consistent with the idea that the additional words overload verbal working memory, drawing limited attentional and comprehension resources away from the core verbal explanation.’ The lesson with text is to cut it ‘til it bleeds! Bullet points, simple writing, highlighted keywords and short paragraphs are all useful screen writing techniques. They are critical of gratuitous graphics which are added to simply fill slots on pages of text. This is not uncommon in e-learning where designers simply take a noun within the text and slam in an associated image. 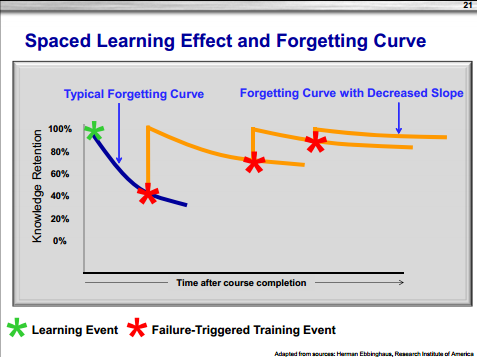 This does nothing, according to Mayer and Clark, than add cognitive load and slow up learning. Background music and environmental sounds create unnecessary cognitive load and distract from, rather than increase, learning. Indeed, music, over longer periods of time can be incredibly annoying. Note that this also applies to sounds, such as beeps or applause, that reinforce right and wrong answers. This may be appropriate in a games, but not for most online learning. Ear candy is as bad as eye candy. They argue that ‘text and simple relevant graphics’ can improve learning as they use separate cognitive channels. They are not absolutist on these rules, as text within graphics can be useful when explaining a process or in labeling. ‘Text and animation’ which both use the visual channel, cause cognitive dissonance and often confuse rather than achieve learning. Animation, like video, should use audio narration, rather than accompanying text. They claim that words in both text and accompanying audio narration can hurt learning. This is interesting as it is often assumed that one needs both to cover accessibility issues. In other words, they argue for using ‘audio and graphics’ without screen text. According to Clark and Mayer (2003), ‘audio or text on their own’ are better than ‘text and audio together’. This is confirmed by another study by Kalyuga, Chandler and Sweller (1999) where the group with audio scored 64% better than the group with both text and audio. They claim that one or other is redundant and will overload the visual and aural channels. 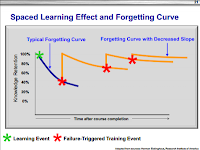 A review of studies around this concept, known as the redundancy effect, by Sweller et al (1998) cites a list of research studies that all point to the damage done to learning when redundant material interferes with the efficacy of the learning. For example; they illustrate a point about leaving out extraneous or distracting graphics in media with an experiment, conducted by Harp and Mayer (1997), in which students were given a text to read on lightning strikes. Students who read the passage accompanied by elaborate colour photos with additional captions - as opposed to the text with simple graphics - showed 73% less retention of knowledge and 52% fewer solutions on a transfer test. Mayer (1989), Mayer Steinhoff Bower (1995) and Moreno and Mayer (1999) in five separate studies compared graphics with text close to the graphics, and graphics with text below the graphics, at the foot of the screen. In all five studies, learners who used the co-located text and graphics improved their problem solving by between 43-89%. Similar results have been found by Chandler and Sweller (1991), Pass and Van Merrienboer, (1994). Making the learner’s eye jump from one part of the screen to another is disruptive and reduces the effectiveness of the learning. E-learning has also introduced heavy doses of rollover text which is displaced away from the item over which the cursor rolls so that the pop-up text appears elsewhere on the screen at a distance from the item in question. The research confirms that this is to be avoided in learning programmes. Backed up by the work of Nass and Reeves at Stanford (subject of my next post), they recommend a more conversational style, using first and second person language. This is not to say that it should be over-friendly or condescending. It should feel like a dialogue, not a lecture. They also recommend the use of an on-screen coach or agent. Note that they absolutely recommend self-paced user control, as well as frequent practice and context setting through interactions. Their research explains why broadcast TV and web design companies often fail to produce good online learning. They are drawn to techniques that entertain rather than educate, often adding media that unintentionally degrades the learning experience. This is why Nielsen and others were so critical of Flash, as it encouraged, the unnecessary addition of animation. On the other hand it confirms the use of short video lessons, with images and audio, as a form of instruction. 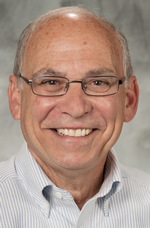 Clark and Mayer were among the first to seriously research the use of media in e-learning and have come up with empirically tested conclusions, often repeated by others, which suggest that many common practices in e-learning design are, in fact, wrong. They actually result in harming rather than helping the learning process. They call for simpler, less gimmicky use of media. Animation and audio do NOT necessarily lead to better learning and may, in fact, degrade the learning experience. I'm not a dropout, I'm a dropin! I've dropped in to a number of MOOCs recently. Some I've liked and persevered with, others I've had my fill after a short-time, for most, life is too short and \i don't have the time, yet others have been awful, too slow and ponderous for words. But it's all good, that's what I expected. But I resent being universally classed as a 'dropout' and used as an excuse to dis' MOOCs. Is it inappropriate to take the word ‘dropout’ from one context and stamp it upon another? With MOOCs I’d call it a category mistake, when a word is used to mean one thing (pejoratively) in the context of a long school, college or University course, then applied with the same pejorative force to a very different type of learning experience. Stopping during a MOOC is very different from dropping out school, an expensive long-term degree or a compulsory compliance course. Lots of people dropout from MOOCS, so what? Lots of people stop doing lots of things. Lot’s of people don’t finish books but we don’t see this as a sign of intellectual failure. In fact, it can be a sign of efficient learning and research. Read Pierre Bayard’s brilliant ‘How to talk about Books youhaven’t read’ to see how prevalent and positive this can be. Lots of students don’t attend lectures. Imagine running a restaurant where all the meals have been paid for in advance, yet huge numbers of customers don’t turn up – that’s not unusual in Universities. Yet is there a demand to take a register in all lectures to collect the most basic form of teaching data? NO! Lots of students attend lectures but drop out in terms of attention. In fact they nearly all do, as it’s a predictable function of the 1 hour lecture, whose length is based upon the fact that the Babylonians had a sexidecimal number system, not the psychology of learning. Yet we don’t demand any checks during lectures on psychological attention or insist on more action learning. 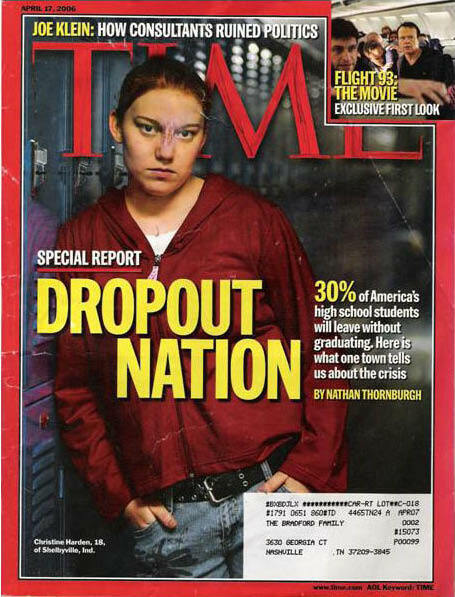 Lot’s of people drop out of college because the course, institution, teaching method, boredom, other opportunities, debt or academics are not for them. In fact, as any lecturer will tell you, colleges are full of people doing courses for reasons that have little to do with genuine interest in the subject. In fact, many degree courses simply lock in students to long-term 3/4 year courses. MOOCs encourage the ‘look see’ approach to learning, and as they are free or very cheap, the consequences are negligible. Do the people who don’t finish a MOOC rush back to college or Universities with cheques in their hand? Of course not. The decision to take or drop out of a MOOC is not a life changing decision in terms of money, time or commitment. Many MOOCs are, in fact, VOOCs (Vocational Open Onine Courses) where the aim is upskilling, not academic progress. Take Sebastian Thrun’s famous AI course. 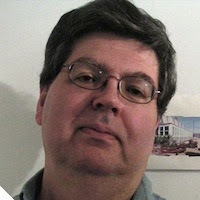 He was teaching 200 students at 30k a year, suddenly he had 160,00o students who paid zilch. The fact that his own internal students opted for the online course, 26,000 students finished and that the top 400 students were all external and online is astonishing. Think on this. If we forget dropout and focus on the true comparison, 200 versus 160,000 means that it would take 800 years using traditional methods. Even with the 26,000, that’s 130 years! The data for Duke’s first MOOC has come out, and at first it looks depressing but they don’t think so. Bioelectricity (Coursera) registered 12,461 (from 110 countries) with 7593 watching at least one video. 313 completed certification (basic+distinction) with 260 (distinctions). The real story here is that the number of students who completed the course is over ten times the campus enrollment. Note that I’m not saying that uptake is not an issue. It is in terms of investment and growth. The monetisation of MOOCs is important in terms of their sustainability but the monetisation models are evolving quickly to include recruitment, advertising, delivery fees and low cost certification. 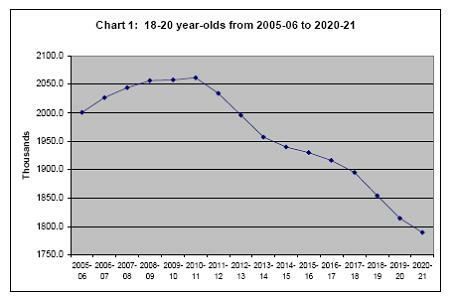 Demographically, the number of UK 18-year-olds will decline over the next ten years by 11%. This will have a long-term effect on University applications. Projections released this week from the US Department of Education show enrolment figures for 2010-2021 falling miles below the 46% growth experienced between 1996-2010. This is already playing out in California, where there is a demographic shift to negative growth, combined with crippling state debt. Overall, a new report has shown that the projected ‘pupil cliff’ will result in the “death of the growth agenda in the US”. Scarcity creates value, commoditisation destroys value. Youth and graduate unemployment has gone through the roof in some countries and is still rising across Europe. The spectre of a high-cost degree with a low-salary future is starting to bite. A degree is no longer the goal but THE degree from better brand institutions. Because degrees have become commoditised, employers are also less interested in their value. Music, newspapers, retail in general, have all been commoditised through Napsterisation. The same thing is happening in learning. We have seen student costs soar in the US, UK and elsewhere, way beyond inflation and house price rises, yet the deliverable remains much the same. Remind you of the property bubble? Student loan costs have risen well above that of credit card debt in the US. When faced with student fees in the UK, many have chosen not to apply. Yet little has been done to lower the cost of HE which is still rooted in a high cost model based on low occupancy buildings, one intake a year, long vacations and inefficient teaching. Cost is pushing more young people to reject HE. ‘Debt’ is a dagger of a word that now strikes fear into people. It alone almost led to a global meltdown, is tearing apart the European Union, has led to massive youth unemployment and is NOT going away any time soon. To take on debt now, is to take on a massive risk. It will affect your ability to buy a flat or house, have children, sustain a credit rating, with no guarantee of a job with golden prospects. Potential students have wised up to this fact. Universities struggle with rapid, innovative change and governments are still stuck in the mindset of more degrees as an intrinsic good. Peter Thiel identified this as one of the fundamental symptoms of a bubble – groupthink. ‘The nth degree’ problem is the simplistic idea that the more degrees we fund the better. Forget the fact that the world has been brought to its fiscal knees by graduate bankers or that many of the skills we require are not taught, or taught badly, at our Universities, we need to reduce costs through the mass adoption of cheaper solutions, such as online learning. This, especially in the UK, has hindered innovation. The race is now on. Different models are emerging that lower costs and increase reach and access. This draws students away from traditional HE. MOOCs, with accreditation (Signature Course from Coursera), are now available. Other models are emerging, such as separate online departments within Universities (UDOL – University of Derby Online), outsourcing to online delivery companies that have multiple yearly intakes, low costs and no VISA problems (Interactive Design Institute). These are, at present, modifications to the existing model. But there are other more radical, tectonic shifts at work here. There’s a genuine thirst for shorter, faster courses, that are available when you want them, more relevant apprenticeships and high quality workplace learning, and not just the 18 year old undergraduate meander through a 3 or 4 year degree course. Unlike the fiscal cliff, there is no sign of any immediate solution to this problem, other than taking the pain. There’s no way politicians can do a 180 degree (sic) turn on this but that’s what’s needed. After decades of expansion, the whole system has ballooned out of control with quality, and now quantity, falling. The danger is in behaving like lemmings heading towards the student cliff without adequate planning.